← How many minutes a day does your preschooler spend “untethered”? My child is struggling to learn short vowel sounds. What can I do? As a temporary help, you could create word lists or flash cards using color-coded letters for the vowels. In Tutoring is Caring, Montessori teacher Aline D. Wolf suggests printing the letter representing the vowel sound in a particular color to help the child remember the sound. She suggests using colors whose name has the letter sound that the child is trying to say. So for example, short e words would be written with red e’s. Since vowels are the most difficult sounds for the child to master, the color would alert the child that the colored letter is a vowel, and the color would also give the child a clue as to the letter’s pronunciation. Red for the short e sound since red’s vowel sound is short e.
Rust for the short u sound since rust’s vowel sound is short u. 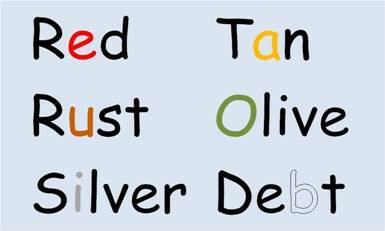 Silver for the short i sound since silver’s vowel sound is short i.
Tan for the short a sound since tan’s vowel sound is short a.
Olive for the short o sound since olive’s vowel sound is short o.
Wolf says it is important that the child recognize the colors using their specific names. If a child sees olive and says green, then the clue that the sound of “ol” gives would be lost. She recommends beginning with “e” and then “u” because they are easier. Wolf wrote her suggestions in 1981, before personal computers, so today we have other options. Using a computer, it is easy to duplicate these colored letters in words, just as using crayons or colored pencils makes it easy by hand. Another suggestion she makes is to use broken lines for silent letters, a signal to the student that the letter is necessary but it is not pronounced. This is easy to do if you are handwriting the letters, but I could not find a broken letter type face on my computer. However, the computer offers other options such as outlined letters or highlighted letters, either of which could indicate silent letters. With her lists of color-coded words, Wolf puts a drawing of a word that begins with that letter at the top of the list as an extra reminder of the letter sound. So for short e, there is a drawing of an elephant; for u, an umbrella; for i, an igloo; for a, an alligator; and for o, an olive. Cautioning that color-coding is a crutch, Wolf says it should be used as long as necessary, but that gradually the child should be weaned from the colors. For children who don’t need the extra boost that colored letters give, they should not be used at all. How to wean a child? Wolf suggests that the child could match color coded words with the same words printed in black. Or the child could match words printed in black with objects around the house or at school such as milk, pan and egg. The child could also match words with pictures. This entry was posted in letter sounds, methods of teaching reading, phonics and tagged CVC, letter awareness, vowel sounds. Bookmark the permalink.